Okay so yes I'm absolutely horrible at these and I can't do it monthly, i'm sorry. However I woke up this morning and just felt the need to fix myself, so here are some goals that I will follow and I hope you do too, whether you're following all or just a couple that appeal to you. I keep on talking about doing this on this blog and I still stick by everything that i've said and I do do it, just not as often as I think I need to. Apart from the obvious benefits it's just the personal feeling of absolute privacy that I feel when I don't have my phone around and I do feel better when I'm solely relying on myself and not any of my tools for a bit. I absolutely love long walks and it's usually with my family or friends which is great and I love walking with them but I just feel like everybody needs walks alone when their phone is on airplane mode or they didn't even carry it at all. Whether it's midnight walks or it's mid-morning winter sunshine filled walks, I just feel like I need more of them, they're the ulitmate rejuvination. I'm one of those people who makes crazy to-do lists every single morning and fails to accomplish even half of it at the end of the day. This isn't because I haven't worked hard enough ( although I must admit that Netflix is a b***h ) it's just because the to do lists are absolutely insane and humanly impossible. So setting higher goals for myself would mean lesser things on my to-do lists which I know I can accomplish and actually receiving the satisfaction of doing them all. I find that this way I actually end up doing a lot more things rather than when I have crazy ambitions. However this for you could mean higher goals in school, work, extra circulars or whatever your interested in. 4. De-stress with family & friends more often. As you can tell by now I'm a busy person and most of the time I'm a ridiculously stressed person. Usually I don't mind this mainly because i'm used to it but when I do de-stress and get manicures with friends and go out for a coffee with my family I feel amazing, obviously! So I just think it's dumb for me to not do this more. 5. Let Go Of Expectations & Live In The Moment. I think I'm going to write a blog post talking about this is in more detail just because it's incredibly easy to say "let go of expectations and live in the moment" but it's a lot harder to actually practice it. I've been trying to do this for a while now and I can in no way say that i'm able to constantly practice it but I have gotten a lot better and it's amazing to not constantly worry about the future and past and other people's lives but instead just focus entirely on your own every single second, and recognize that you're doing it. 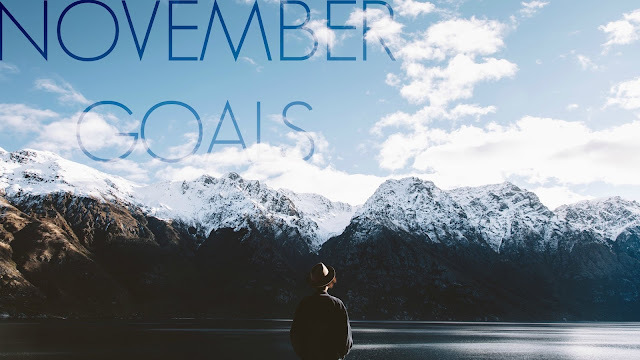 Well these are my November Goals and I hope you liked it and I hope this inspired you in any way to form your own goals, adapt a couple or all of mine or even if you just liked knowing what my goals were without actually getting involved yourself.